High school sororities are pretty rare these days, especially in the United States, but if your high school has one, they can be a great opportunity for young girls to develop lasting friendships, a service oriented lifestyle, and even great study habits. Usually, members of a high school sorority aren't accepted based on academic merit, but they frequently do great service to their school and their community, and are active participants in all school functions, proudly displaying their school spirit. Though high school sororities were once considered a staple at any high school, some administrations have decided that sororities, fraternities, and other secret societies encourage competition among students who should instead be friendly and helpful to one another. If you are unsure about how your administrators might feel about sororities at your school, be sure to ask if they will allow you to wear honor cords at graduation that represent your involvement with a sorority. Sorority honor cords should inspire school spirit and appreciation for student experiences, not create tension among student and administrators. Graduation is the perfect time to reward your students for their participation in worthy pursuits during high school, and one of our graduation cords is sure to be perfect for the occasion. Our cords come in a wide variety of colors, like teal and lavender, and seem are even braided cords that use multiple colors, like our classic red white and blue cords. Sorority honor cords for your high school sorority are typically in the sorority colors, but you can be as creative as you like. 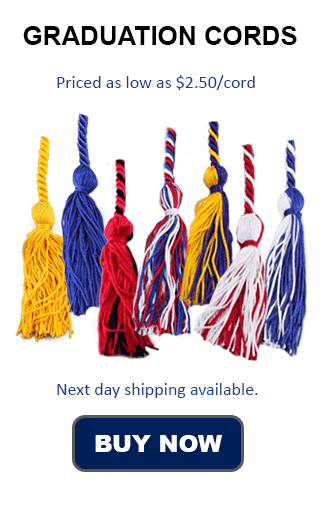 Our flat shipping rate of only $4.00 will ensure that you get your honor cords on time and at a great low price. Order your high school sorority honor cords from Honors Graduation today, and give your high school sorority girls a lasting gift that will remind them of their wonderful high school experiences.